In our day and age, automobile exhaust is cleaner than it has ever been. However, the most dangerous component of car exhaust – carbon monoxide – remains a serious threat to people everywhere especially drivers, children, mechanics and pets. One of the cardinal rules of auto repair is that you never, ever start your car in a closed garage or shop. Without adequate ventilation, running an automobile in an enclosed space is extremely dangerous and can lead to injury and death to occupants inside. Recently, a woman and her mechanic unfortunately died as a result of carbon monoxide poisoning in a closed garage in Newark, New Jersey. Again, never start your car with the garage door closed and ensure that you have a working carbon monoxide detector in your garage, shop and in your home. What Happens when CO is Inhaled? 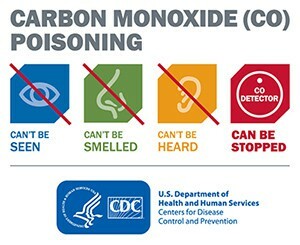 The problem with carbon monoxide is that the toxic CO fumes are colorless and odorless. They gather quickly and immediately enter your body’s respiratory system leaving you lightheaded and short of breath. As the toxic combustion byproduct accumulates in your blood stream, you will experience anoxia – a condition where your organs are not getting the oxygen they need to function. Carbon monoxide will continue to starve your body of oxygen and when organs don’t get enough oxygen, it leads to organ failure. Death is the end result. 1. Avoid running vehicles in a garage or shop even if the door is open. 2. Avoid backing your car into the garage (this will increase the amount of exhaust trapped inside the garage). 3. Comply with all service bulletins and directives on emissions inspections. 4. Inspect exhaust systems for leaks, cracks or weakening areas indicative of corrosion, look for noises or odors. 5. Install carbon monoxide detectors in your working spaces (carbon monoxide detectors emit a loud alarm – similar to smoke detectors – when a certain amount of carbon monoxide is detected in the air). If your vehicle has an exhaust related issue, we encourage you to schedule an appointment with an experienced mechanic to have your vehicle inspected and repaired if necessary.